In this Friday, Jan. 12, 2018, photo, Chris Bagley of Sebago Signworks pulls off the covering of a new Consolidated Communications logo he applied to the door of a former FairPoint truck as fleet mechanic Steve Morin looks on in Portland, Maine. PORTLAND, Maine — About 1,000 Consolidated Communications workers across Maine, New Hampshire and Vermont are going to begin voting this week on tentative contract agreements that were reached late Saturday, averting a potential strike. Union officials said agreements with the International Brotherhood of Electrical Workers and Communications Workers of America protect jobs, maintain affordable health care and provide enhanced retirement benefits. But a small number of call center jobs could be moved out of the region, causing alarm for workers concerned about job security. Jim Feeney Jr., a technician based in Bangor, said he was concerned for the call center jobs, which he said need to stay in New England. These were the unions’ first negotiations with Consolidated Communications, which purchased FairPoint Communications last year. Workers’ last contracts with FairPoint were preceded by a four-month strike that began in October 2014. Don Trementozzi, president of CWA Local 1400 and co-chairman of the unions’ bargaining team, said hard-fought negotiations led to the best possible agreement for workers. Consolidated originally proposed moving all residential call center jobs out of northern New England, he said. The final proposal provides early retirement incentives for those 128 full-time workers, and caps the number of jobs that could be moved at 55 percent, he said. “We saved a lot of jobs and got a good exit package. The goal was to get the best package and to let our members vote on it,” he said. Workers who already authorized a strike will vote this week. The two unions are united, and won’t cross the other’s pickets if it comes to a strike. Illinois-based Consolidated Communications provides telephone and broadband internet in northern New England. It also operates in 21 other states. Workers are concerned that the loss of any jobs could lead to a flood of job losses, along with the loss of autonomy of the three-state region. But the company contends it needs flexibility when it comes to hiring subcontractors to expedite repair, maintenance and installations. Bob Udell, Consolidated president and CEO, said in a statement that he was pleased with the outcome of the negotiations, and hopes the contracts are ratified. He believes the company has turned the corner in labor relations. Many workers were frustrated with North Carolina-based FairPoint. “Since our acquisition of FairPoint a year ago, we have seen a notable improvement in the relationship between the unions and the company, and this agreement reflects that progress,” Udell said in a statement. Communications and unions representing about 1,000 workers in Maine, New Hampshire and Vermont reached tentative agreements on new contracts late Saturday, averting a potential strike. The International Brotherhood of Electrical Workers and Communications Workers of America authorized a strike but the labor agreement came before the old contract expired at midnight Saturday. Details of the three-year agreements were not immediately available but union officials said in a statement they protect jobs, maintain affordable health care, and provide enhanced retirement benefits. The agreements responded to the needs of workers and customers while also addressing fast-paced changes in the telecommunications industry, they said. “We promised we were going to try to get the best possible agreement for members. We achieved our goals,” said Don Trementozzi, president of CWA Local 1400 and co-chairman of the unions’ negotiating team. “I don’t think it’s in the best interest of either party to have a strike. The telecom industry is very competitive these days,” he added. Union workers in the three states will hold meetings in the coming days to discuss and vote on the agreements. These were the first negotiations since a four-month strike preceded an agreement with FairPoint Communications. Illinois-based Consolidated purchased FairPoint last year. Consolidated Communications provides telephone and broadband internet in northern New England. It also operates in 21 other states. Bob Udell, Consolidated president and CEO, said in a statement that he was pleased with the outcome. “Since our acquisition of FairPoint a year ago, we have seen a notable improvement in the relationship between the Unions and the Company, and this agreement reflects that progress,” he said. Workers were out for 131 days after walking off the job in October 2014. During that strike, there were widely documented reports of customer service problems including long telephone call waits and delayed service calls. 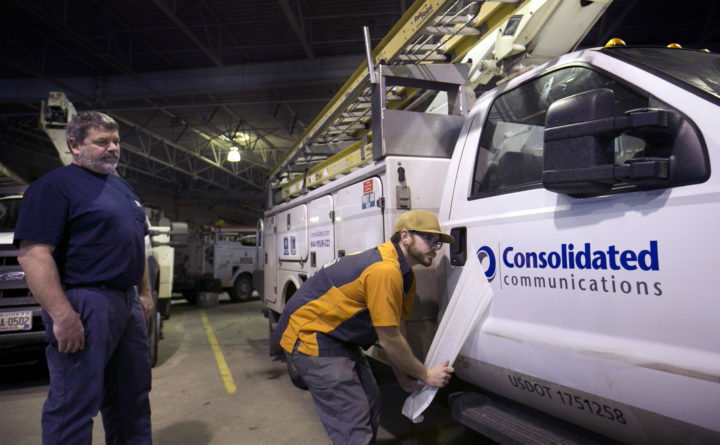 Consolidated Communications said it was negotiating in good faith but had a strike contingency plan involving hundreds of trained managers filling in for union workers. Union workers were especially concerned about the company’s proposal to make greater use of subcontractors. The company contended it needs flexibility when it comes to hiring subcontractors to expedite repair, maintenance and installations, and that no workers will be laid off as a result. The last strike began after North Carolina-based FairPoint froze pensions, imposed pay reductions on new workers, eliminated retiree health insurance and allowed the company to hire more outside workers. The agreement that ended the strike allowed employees to keep their defined benefit pension plans but there were concessions on company contributions, health care costs and other issues. Consolidated ultimately bought FairPoint, doubling its fiber optic network and creating a company with operations in 24 states. The $1.3 billion transaction was completed last July.